I will be post photos later today. I don't know much about these pistols.. but I now have one, let me know what you think. (I'm pretty sure it's a non refurb as there is no refurb marking to be found) may someone that knows a thing or two can say a few words about it. Thanks. The frame and cylinder are matching but i have not taken it apart anymore than that. 1944 Izhevsk without the nasty billboard import markings, nice. As you said I am not seeing a refurbishment marking anywhere, I'll wait to see what the Brain Trust has to say. I see the import markings on the barrel, I like it better than mine, mine has the import markings partly covering the arsenal information. Last edited by ffuries on Tue Aug 01, 2017 11:00 pm, edited 1 time in total. Yes, nice small import mark. I never gave much though about these pistols in the past but now that I have one I like it. Based on the wear on most of the stampings and the metal finish and texture suggests it's been sanded and refurbed. Inbelieve it just didn't get marked with a refurb mark. Does appear to have a lot of Izhevsk marked parts which it a plus. Still a nice example, congrats. I had doubts about it being a refurb or not, the finish is very nice and with it being 1944 i though I might get lucky. I do agree that it's likely a refurb that never got the stamp. Thanks for the info. I've got one very similar to that. Don't get to shoot it much. I must respectfully disagree. It is true that you might not be able to hit anything initially with a Nagant revolver, but once you get the hang of them they are quite accurate. I can usually get about 3" groups at 25 yards firing two handed double-action (slow-fire). 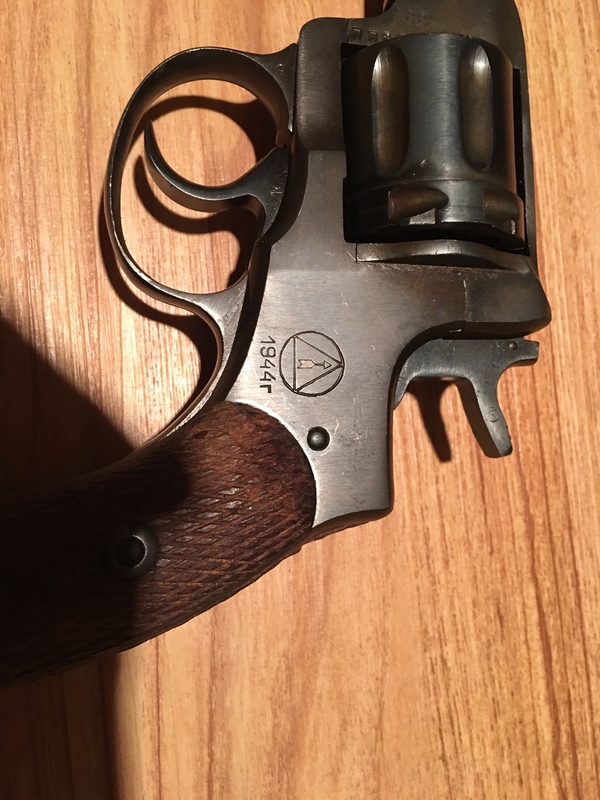 I have said elsewhere (and continue to stand by it) that a Nagant revolver is the greatest double-action dry-fire practice device ever invented. 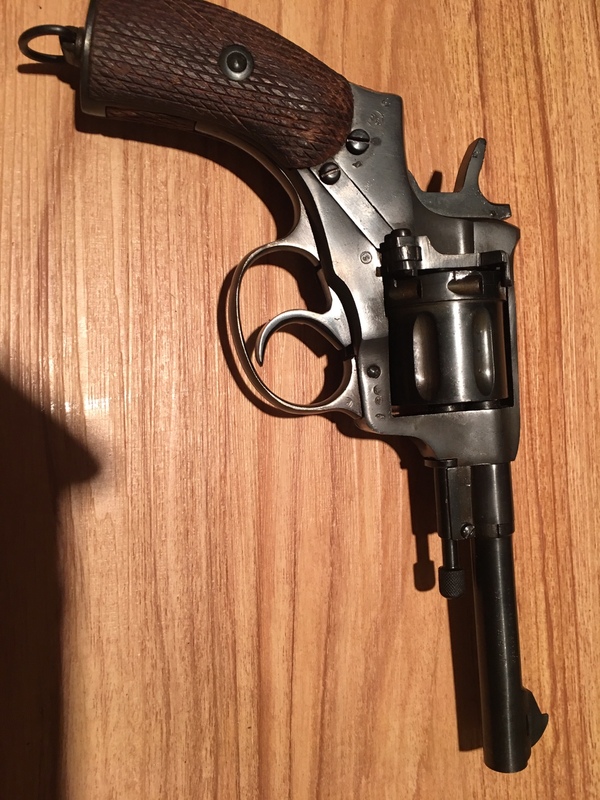 After about 10,000 DA dry-fire cycles you will have strengthened your index finger to the point that shooting a Nagant double-action is no big deal. However, the big payoff is that any other double action revolver you pick up thereafter will appear to have a custom (light) DA trigger pull. Extensively dry-firing a Nagant dramatically improved my DA shooting with Colt, Ruger, and S&W revolvers with respect to both speed and accuracy. Nagants are not inaccurate, just clunky. One thing you don't often see as an actual useful attribute of the Nagant is its ability to shoot several old low power revolver calibers. When people are trading potatoes for .22lr rds. and there ain't any more Pow-R-Ball or SXT down at Cabela's the ability to shoot .32 Colt and S&W Short and Long or that odd round of .32 H&R Mag could be useful. Yes, I know that none of these would be a first choice for SD, but they sure beat a Wrist Rocket. Yes, if we ever do get to the point where we trade potatoes for .22 rounds then your point is well-taken and I would use .32 S&W long or short cartridges in a Nagant revolver if I had nothing else to shoot. However, I think it really needs to be pointed out that the Nagant revolver has no forcing cone to "funnel" bullets that are not perfectly in line with the bore. The cylinder end of the barrel is really more of a flat-bottom counterbore than a funnel. This means that in order to not shave lead with non-standard cartridges the bullet has to be almost perfectly in line with the bore at the time of firing. In Nagants with timing issues, the short portion of the 7.62x38R cartridge case that protrudes out of the end of the cylinder acts as an alignment cam to force the cartridge/bullet combination into line with the bore as the cylinder moves forward prior to the hammer falling, and is a designed component of Nagant revolver timing. If the timing issues are severe then the unique Nagant crimp will hit on the edge of the barrel extension and won't allow the cylinder to go fully home, preventing the revolver from firing. This fail-safe is bypassed when using standard .32 revolver cartridges and is the reason why so many people experience lead shaving. The straight-walled cartridge is sitting loosely in a tapered chamber and the bullet has a long leap to enter the barrel. During that leap there is no cylinder throat to help guide and center the projectile and no forcing cone to assist as a last ditch alignment compensator so the bullet may or may not line up with the Nagant barrel at the moment of firing. If it doesn't it will shave and/or spit lead to a lesser or greater degree. Additionally, many advocates of standard .32 revolver rounds use 4 or 5 wraps of scotch tape around each round to help center the cartridge in the chamber and also minimize case splitting, a common phenomenon, especially with .32 S&W Long cartridges. This gets to be tedious after very few wrappings and has to be removed (and re-wrapped) if one intends to reload their .32 brass. Pressure-wise, Nagant revolvers operate nominally at about 16,000 psi. While many people believe (correctly) that the .32 H&R Magnum is a superior round to the 7.62 Nagant cartridge, .32 H&R Mag ammo is more in the 20,000 psi range. Not really enough extra pressure to risk a blow-up but very much like shooting +P .38 Spl ammo in a pre-war S&W in the sense that what you get is accelerated wear. For all the above reasons, since a 50-rd box of correct 7.62x38R ammo costs only about $5 more than a 50-rd box of .32 S&W Long ($25 vs $20) I see no good reason NOT to shoot the correct ammo. Unless we're down to trading potatoes for .22 rounds as, that is. I have shot a 1/2 dollar sized group with the Russian yellow box target ammo at 25yds. I have not been able to do it since. I can regularly shoot 2 1/2 to 3" groups.